Abstract: An association of sphinctozoid and inozoid sponges and the problematic organism Lercaritubus problematicus are described from the Permian Jamal Formation exposed in Kuh-e Bagh-e Vang, south of the town of Shirgesht, in the Shotori Mountains, eastern Iran. The sponge taxa described, are: “Sphinctozoida”: Amblysiphonella rigbyi nov. sp., Baghevangia minima nov. gen., nov. sp., Shotorispongia permica nov. gen., nov. sp., Shotorispongia biserialis nov. sp., Thaumastocoelia? cf. Th. irregularis Weidlich & Senowbari-Daryan, Sollasia ostiolata Steinmann, Sollasia cylindrica nov. sp., Girtyocoelia beedei (Girty), and Lemonea cylindrica (Girty); “Inozoida”: Peronidella recta grossa Wu, Bicoelia spinosa nov. sp., Heptatubispongia symmetrica Rigby & Senowbari-Daryan, Maeandrostia kansasensis Girty, Maeandrostia radiata nov. sp., Solutossaspongia tabasensis nov. sp. Problematic organism: Lercaritubus problematicus Flügel, Senowbari-Daryan & Di Stefano. The sponge fauna of the Permian Jamal Formation of Kuh-e Bagh-e Vang is represented by at least 7 sphinctozoan genera (2 new) and 9 species (3 new) and 5 inozoan genera with 6 species (3 new). Among the documented genera Amblysiphonella rigbyi nov. sp. seems to be the most abundant species, followed by the inozoid species Maeandrostia kansasensis Girty and Heptatubispongia symmetrica Rigby & Senowbari-Daryan. The sponge fauna of Kuh-e Bagh-e Vang is similar to sponge faunas described by Senowbari-Daryan & Di Stefano (1988) from the Lower Permian reef boulders of Sosio Valley, western Sicily, and from the Permian reefal limestones of Oman. The sponge-bearing reefal carbonates of Kuh-e Bagh-e Vang can be classified as sponge-Tubiphytes-Archaeolithoporella-boundstones. 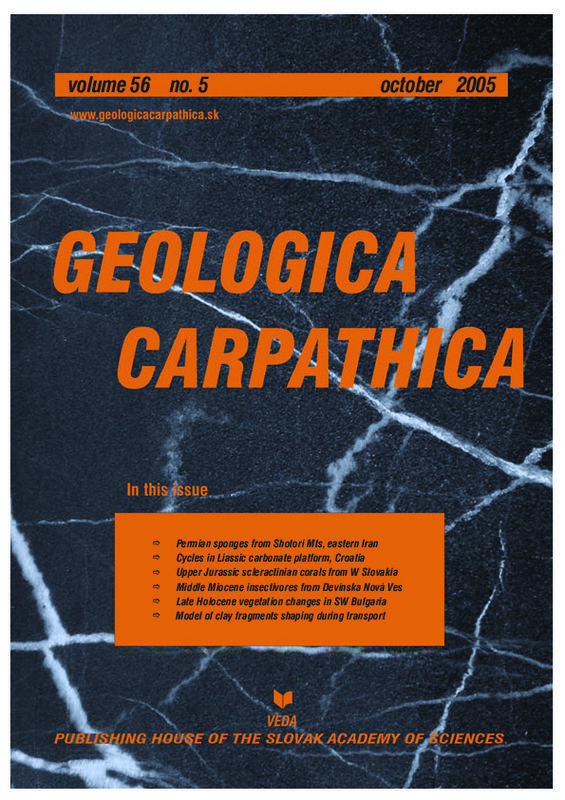 Abstract: The Middle Liassic carbonate succession of Mt Velika Kapela is composed of coarsening-upward cycles. Analysis of facies alternation and stacking pattern reveals a sporadic appearance of oolitic facies indicating oolitic shoal progradation from neighbouring topographic highs. These progradations interrupted the constant “in situ” carbonate sediment aggradation, which produced typical coarsening-upward architecture. Two types of coarsening-upward cycles were distinguished: 1 — cycles with peloidal-bioclastic upper cycle members, and 2 — cycles with oolitic upper cycle members. These coarsening-upward cycles are regarded as a record of the sea-bottom oscillations below and above the fair-weather wave-base and model for evolution and cyclic response of carbonate facies to these oscillations is presented. Abstract: Oxfordian shallow-water scleractinian coral association from the biohermal limestones of the Mt Vrsatec (Czorsztyn Succession, Slovak sector of the Pieniny Klippen Belt, Western Carpathians) comprises 18 species (among them 2 new) plus 3 taxa determined on the generic level only. They represent 13 genera and 10 (or 11) families. The most common are phaceloid coral growth forms from the genus Thecosmilia Milne Edwards et Haime (family Montlivaltiidae). The studied fauna appears similar, though less diversified taxonomically, as compared to those known from the Upper Jurassic shallow-water facies of many other parts of Europe. In the Pieniny Klippen Belt this type of coral fauna occurs only in Western Slovakia. Abstract: Eight taxa of insectivores (Lantanotherium aff. sansaniense, Erinaceidae gen. et spec. indet., Talpa minuta, Storchia meszaroshi sp. nov., Plesiodimylus chantrei, Dinosorex cf. zapfei, Soricidae gen. et spec. indet., and ?Lipotyphla gen. et spec. indet.) have been determined in the Middle Miocene micromammal assemblage from Devinska Nova Ves — Bonanza fossil site. This Late Badenian (MN6) insectivore assemblage comprises several new faunal elements including a new form of water-mole (Storchia meszaroshi sp. nov.). These animals inhabitated a forested coast of an insular region neighbouring with freshwater lagoon, marsh or delta. Most of them belong to juvenile specimens. Abstract: The pollen stratigraphies of Lake Suho Breznishko (1963 m a.s.l.) and Lake Okadensko (2475 m a.s.l.) in the Northern Pirin Mountains of southwestern Bulgaria record the vegetation history since about 6000 years ago. An initial open Betula forest contained minor Pinus peuce, documented by macrofossils, as well as Abies. Conifers that had dominated at higher elevations elsewhere then expanded downslope, and after 4300 yr BP Pinus peuce was joined by Pinus diploxylon-type (including P. sylvestris, P. mugo, and P. heldreichii) and Picea. Maxima of microscopic and macroscopic charcoal, along with increases of Juniperus, Pteridium, non-arboreal pollen (including anthropogenic indicators), and algal remains, suggest significant human impact on the vegetation after about 4000 yr BP. Abstract: Irregular blocks of cohesive clay (IBC) are transformed into spherical clay balls (SCB) during transport across a sedimentary basin bed by runoff. This transformation is controlled by rotation of the IBC about a randomly changing axis. During this process, deformation dominates; abrasion is less significant. Based on a theoretical model, the equation describing SCB formation, Ψ = 1-(1-Ψ0)exp(kλ/πdef), was derived in terms of the SCB instantaneous sphericity, Ψ, the IBC initial sphericity, Ψ0, the transport length, λ, and the effective diameter, def. Based on the proposed model, the length of transport can be estimated if sphericity and effective diameter are known. Despite the verification in the artificial setting, the presented model is valid also for the natural environment of various clay rich cliffs or scarps.